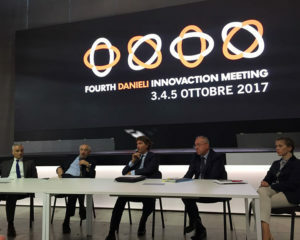 OCTOBER 3-4-5 2017, DANIELI INNOVACTION MEETING: A GREAT EVENT ORGANIZED BY OUR GREAT PARTNER! One of the greatest international events in the steel industry starts today attracting around 600 guests between entrepreneurs, managers, economists and experts from 70 nations spread across all 5 continents. The event, at its fourth edition, will last 3 days and will include meetings, workshop and plant visit, as well as a magic night at the theatre “Teatro Nuovo Giovanni da Udine” where Andrea Bocelli will be performing. The DIM is a unique opportunity for world market leaders to exchange views about the development of steel with long-term projections that arrive until 2035. During this occasion, Danieli’s Team will present the innovations developed over the last 5 years in addition to the global dynamics that will influence the steel market in the near future keeping the focus on innovation, new technologies and competitiveness. “We need to develop a new “vision” on how to face the future, in the awareness that our industry is moving from a global world to a world divided by areas” Danieli Chairman Gianpietro Benedetti said. Alessandro Trivillin, Danieli CEO, added that “if the demand for new plants is flat, the demand for steel is fluctuating”. “Danieli Group – Benedetti, Trivillin and the financial officer Alessandro Brussi highlighted – is good standing, economically solid and the company keeps investing in innovation and technology”. The staff of Alfa Sistemi is proud to take part of this great event organized by Danieli, our partner since years, and our staff wishes the Danieli Group to continue to achieve those results that have enabled it to be one of the 3 leading worldwide companies in the construction of steelworks.